Wondering when you can take the GRE? In this article, we’ll cover the most current information about GRE test dates for 2017 and 2018. We also explain everything you should consider before deciding on a test date. The computer-based GRE can be administered throughout the year, so there’s plenty of times to choose from, but you should still be strategic about which GRE exam date you pick. This guide will help you plan ahead to ensure your GRE (and grad school) success! 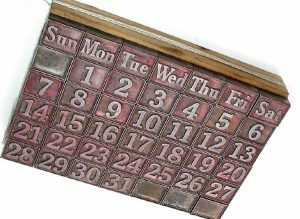 Feature image credit: Calendar by John Nuttail, used under CC BY 2.0/Modified from original. 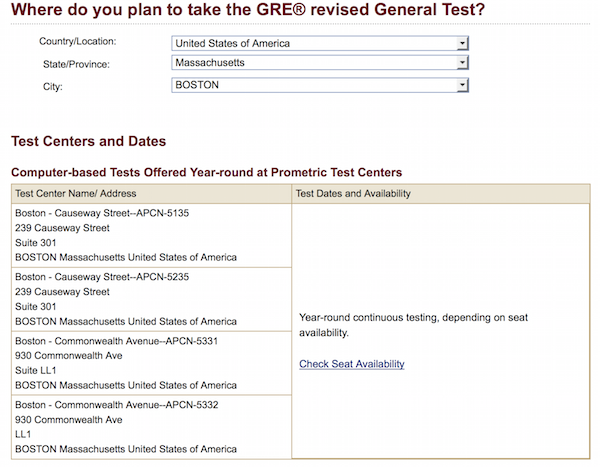 The computer-based GRE is administered throughout the year at official Prometric® Testing Centers and is also offered on some dates at certain non-Prometric Testing Centers. In most countries, the computer-based test is administered “continuously” (which is to say, multiple days a week throughout the entire calendar year). You therefore get your open choice of days to take the GRE! The exceptions to this rule are Mainland China, Hong Kong, Taiwan, and Korea, where the computer-based GRE is only offered one to three times per month and at non-Prometric centers. Registration for the computerized GRE is first come, first served – there is no specific registration timeline or late fees. You can take the computer-based GRE test once every three weeks (21 days) and up to five times within a one year period (365 days). Based on these restrictions, you should plan your GRE schedule accordingly. Think about when scores expire compared to when your application deadlines are and be strategic about when you choose to test. As of July 1, 2016, all GRE scores are reportable for five calendar years from the day you took the test. For instance, tests taken on December 2, 2017 are reportable through December 1, 2022. Since in most countries you have the choice of open test dates and a lot of flexibility, the #1 thing you need to decide is what the best GRE exam date is for you. Here are four steps to help figure this out. #1: When are your application deadlines? The earlier you can take the GRE before your application deadlines, the better. That way, if you end up dissatisfied with your scores and wanting to retake the GRE, you will have sufficient time to do so and still have your scores reported. If possible, take your first GRE a year ahead of application deadlines – this will give you plenty of time to re-take the test if you get a low score. #2: How much time do you need to study? If you take the GRE without first assessing your current performance and how much you need to improve, you’re basically throwing your money away. 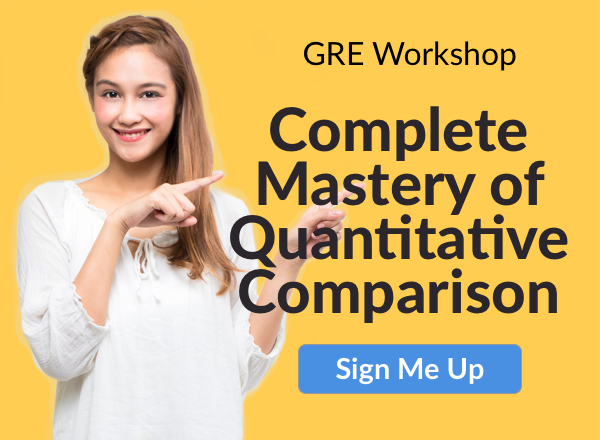 Take a timed, official practice GRE to determine your current level, research the programs you’re applying to and determine the required level, and then calculate the difference between the two. Once you’ve done this, you can then plan out a study schedule. The more you need to improve to meet your personal score goals, the more time you need to leave yourself to study. As a rough rule of thumb, improving a section score by 5 points might take you between 20-40 hours of prep, or even more. #3: Computer GRE or Paper GRE? Knowing which version of the GRE you’ll be taking is instrumental to planning out your test date. Since the paper GRE is offered far less often (only three times a year), the test registrations tend to fill up much further in advance of the test date than computer-based GREs. Look below to see which countries offer only the paper GRE. #4: Do you have to register for the GRE via paper (rather than online)? If so, you’ll not only need to meet an earlier registration deadline, but you’ll also want to allow time for ETS to process the paperwork that goes along with your request (especially in case it’s denied and you need to reapply). Whether it’s for religious reasons, because you’re requesting a supplementary test center, or for a health-related need, if you have to register for the GRE through the mail, you’ll want to allow at least 2-12 weeks of extra time before the registration deadline. Keep in mind as well that some test dates (October and November ones in particular) tend to fill up because of their proximity to application deadlines, so if you want to take the GRE during those dates at a convenient test center, make sure to register at least eight to ten weeks in advance. If you’re well ahead of your application deadlines, then aim to take your first GRE one year before the application deadline. If your deadlines are in January, then take your first GRE around January the year before. This will give you up to four chances to retake the test before your applications are due. And if you work hard and get a great GRE score early, this will give you peace of mind to focus on building a great grad school application. Before your first test, try to study at least 40 hours for the GRE. This will give you the best shot of getting a good score and prepare you for the test. We recommend not taking the official GRE with zero prep, as it’s very unlikely you’ll be at your full potential. If you have just a few months until your applications are due, then it’s crunch time for you. From your application date, work backwards. Find the last possible date you can take the GRE given your school deadlines. This is your final possible GRE test date. Next, go back 21 days, which is the amount of time required between each re-taking of the GRE. This will be your next test date. Up until your next test date, study as hard as you can. You should work hard to get the GRE score you want on your first try – don’t count on your final test date as a last chance. Because of the way the ETS website works, you have to go through the GRE registration portal in order to find when the GRE is being offered at particular test centers. Don’t worry, though – you don’t have to actually register for the GRE when you do the search. Start by selecting the country you’ll be testing in. 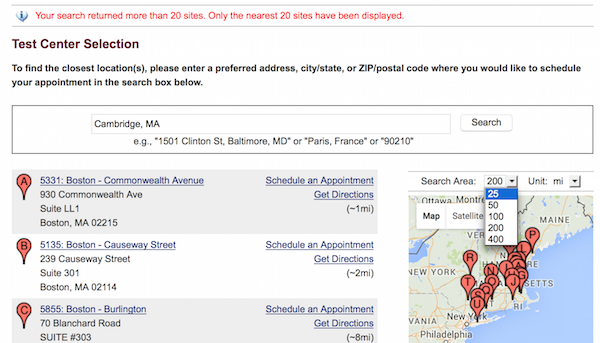 If you don’t see your city on the list, don’t worry – the next page will allow you to put in a specific address you want the testing center to be close to. You’ll be given a list of GRE test centers with availability near you, unless you live in China, in which case you’ll have to go to an external site. Click on the seat availability link (on the right side in the above image). Once you click on the link, you’ll be taken to another page where you have to put in your address to find the testing centers near you and hit “search.” Once the results load, you can then narrow the search radius (I’ve chosen 25 miles since there are enough test centers close to me that I don’t need to search for ones 200 miles away). This particular feature is nice because if you live near the border of a state or province, you’ll also get testing centers that are close to you but in a different state. Above is an example of what the test date calendar might look like. You can click on the underlined dates to see what times are available on the open dates. It’s kind of a cumbersome and redundant system (if you’re going to put in your address eventually anyway, why do you have to specify city and state in the first place? ), but there you have it. For the most part, you can only take the paper version of the general GRE if you’re in an area of the world without access to the computer-based GRE test. As such, you will have access to one test or the other, not both, though there are a few countries where the two versions are offered in relatively close locations. The bad news for paper GRE test-takers is that the paper-based GRE general test is only offered up to three times a year. Also, unlike with the computer-based GRE, there are registration deadlines (because the test centers need to make sure they have enough test booklets and materials for everyone taking the test). The good news is that there aren’t any testing restrictions on frequency of paper-based testing – you can take it as often as it’s offered. Monday testing is available for paper GRE test-takers who can’t take the test on Saturday for religious reasons. The registration deadlines for Monday testing, however, are about three weeks earlier than they would be for the equivalent Saturday test, as you can see in the charts below. Below you’ll find paper-based general GRE test centers listed by date and location. The general GRE is available up to 3 times a year, but not all test centers offer all test dates. We’ve marked available test dates with a “Y” – if there’s no “Y,” then the test isn’t offered that day in that location. The restrictions on reportable scores are slightly different if you took the GRE between August 1, 2011 and June 30, 2016. (If you took it before then, your scores have been purged from the ETS system and are no longer reportable.) For test-takers who took the GRE in this period, General GRE Test scores are available for five years after the testing year in which you took the GRE. The testing year ran from July 1st of one year to June 30th of the next, so scores from July tests, for instance, will be valid for longer than tests taken in June of the same year. To take a concrete example, let’s compare two students applying to grad school, Helen and Paul. Helen took GRE in June of 2013, and Paul took it in September 2013. Assuming both students are applying to grad schools with January application deadlines, Helen will have to apply to grad school by January 2018 (because her scores expire June 30, 2018), whereas Paul can wait another year and apply to grad school in January 2019 (because his scores expire June 30, 2019). Ready to register for the GRE, but want more details? We’ve got complete guides to GRE registration and GRE exam fees. Now that you know when the GRE is offered, when should you actually take it? Find out how long you should study for the GRE. What’s actually on the GRE? Learn more about the GRE test format and how it’s scored. Next Next post: GRE Score Range: What Does Your Score Mean? GRE General Info	GRE Score Range: What Does Your Score Mean?